Deters Burglars: A well lit home will keep criminals from approaching your property. In fact, most crimes that are committed at night are in areas that are dark. 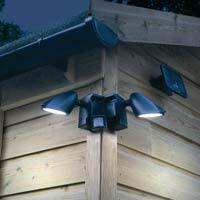 Home security lights include motion sensor lights and other outdoor security lighting as well. Keeps Vandals Away: With lighting placed strategically around your property, you are reducing the likelihood that your home and/or vehicles will be vandalized. Vandals can cause property damage to your home and car. Increases Security: Security lights allow you see who is at your door before you open it. When the lights go on, you can see people while they walk up to your home. You may even want to add home security lights to indoor areas that need protection. Lowers Home Insurance Costs: Adding home security measures like outdoor security lighting may lower your homeowner’s insurance costs. A well protected home is less likely to be burglarized and insurance companies love that. They will reward you for good home security with discounts. Reduces Accidents: Placing home security lights in dark areas will help prevent you from mishaps. They are especially helpful for navigating stairs and walkways. If you have a pool, outdoor lighting is essential to prevent potential accidents.